Sweet adzuki bean paste rolled into matcha-flavored dough with a dollop of buttery frosting… a confection you might expect to find in a trendy coffee shop in San Francisco’s Mission District. My culinary love affair with matcha green tea is deepening. Cookie dough was an easy place to start with the distinctive flavor of this Japanese tea. In the midst of sampling my matcha butter cookies, my mind was already racing to the next possible recipes that could feature matcha… and then I remembered the bag of dried adzuki beans sitting on the shelf. 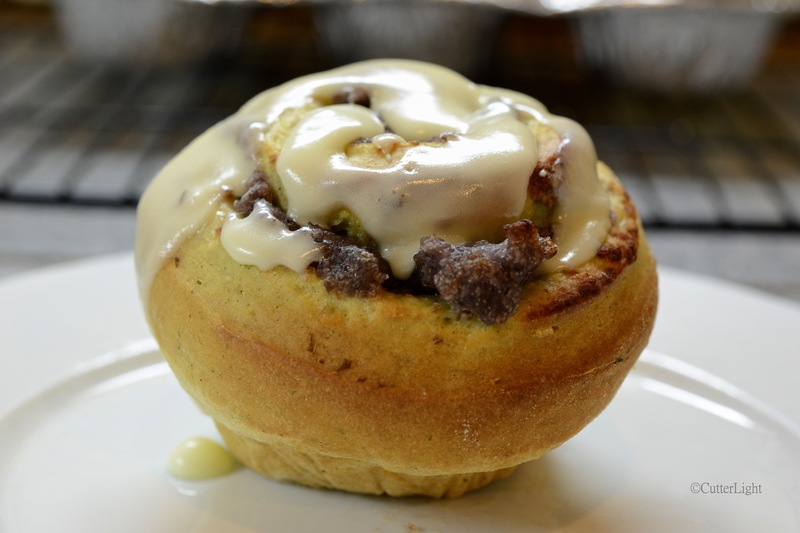 What about sweet adzuki bean paste rolled into a matcha green tea dough – an Asian fusion cinnamon roll? Brilliant! All the fun of unrolling breakfast and enough tasty sweetness to satisfy without the gooey sugar overload of a traditional cinnamon roll. Thinking ahead to life in a tiny home, I created a small batch version of these rolls that are made in a 6-muffin tin. I made the rolls the night before and placed them in a buttered muffin tin in the fridge overnight. They rose in the fridge and were ready for breakfast with minimal time and minimal oven energy. All good aspects for a tiny home recipe. Warm milk and butter in a small saucepan until it reaches about 110 degrees F (43 degrees C). Place yeast and granulated sugar into a large bowl. Pour warmed milk mixture into bowl. Whisk together. When dough has pulled together, turn it out onto a lightly floured surface and knead until smooth, about 5 minutes. Roll out dough to about a 6 x 9 inch rectangle. Spread adzuki bean paste evenly onto dough. Take the 6-inch side and roll dough, jelly roll style. Pinch seam to seal. Place pieces into buttered 6-muffin tin. Cover with plastic wrap and refrigerate overnight. Bring rolls out 30 minutes before baking. Preheat oven to 375 degrees F (190C). Bake rolls for 15 minutes. Top will be golden brown. Remove rolls from muffin tin to cool slightly. While rolls are baking, whisk together glaze ingredients until smooth. Dollop glaze onto slightly cooled rolls and enjoy. Leftovers are a good snack served at room temperature. *I made adzuki bean paste using just dried adzuki beans, water and sugar following the excellent directions from Japanese Cooking 101. ← Like Everything Bagels? You’ll Love Everything Bread! Thanks Lea! They turned out to be delicious.